Donnie Allison is a former driver on the NASCAR Grand National/Winston Cup circuit, who won ten times during his racing career, which spanned the 1960s, 1970s and early 1980s. He is part of the "Alabama Gang," and is the brother of 1983 champion Bobby Allison and uncle of Davey Allison and Clifford Allison. He was inducted in the International Motorsports Hall of Fame in 2009. 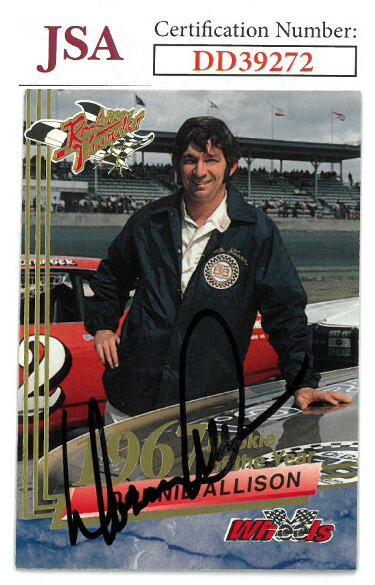 Donnie Allison has hand signed this 1993 Wheels Racing Rookie Trading Card #10. JSA Hologram #DD39272 and Certificate of Authenticity.